MARRAKECH, Morocco, Dec 11 2018 (IPS) - The topic of migration has been beaming across the airwaves of Marrakech, Morocco, to bring light to the Global Compact for Safe, Orderly and Regular Migration conference (GCM) and all its myriad components. Organised by the United Nations Educational, Scientific and Cultural Organization (UNESCO) and other international organisations, Radio Migration began broadcasting on Dec. 4, ahead of the conference, covering various side activities and events organised by local and international civil society components, and by migrant rights activists. Now that the conference is underway—and the Compact has been adopted, as of the morning of Dec. 10—the station’s programmes are focusing on decisions and issues as they happen. It all aims to raise awareness of the importance of the central topic and those in the middle of it: migration and migrants. “The radio station has a clearly defined focus on migration from a human rights perspective, in order to ensure recognition and dissemination of migrants’ rights,” says the radio station project’s coordinator Mohyi El Ghattass, who notes how the station was given a special dispensation by the government. 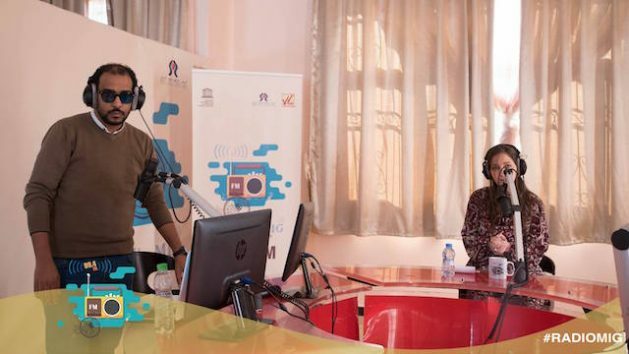 The radio employs 20 people, comprising Maghrebi nationalities from Algeria, Tunisia and Morocco, who received special training on covering thematic migration issues. This team of technicians and journalists has been broadcasting for 8 hours a day while covering a panorama of migration-related events happening around the city both before and during the GCM. The station’s editorial approach has been to disseminate information that addresses both civil society and government actors to create a positive debate and spur evaluation of the factors involved in order to benefit the overall issue at stake. The station has also striven to create open dialogue between different parties involved on migration issues by hosting independent experts, official organisations and activists involved in the rights of migrants, as well as discussing causes of migration and how they relate to specific groups such as women and young people. Such an approach makes for a contrast with much of the reporting about migrants in mainstream media around the world, much of which focuses on stereotypes and negative narratives, says Carolina Gottardo with the Jesuit Refugee Service in Australia, one of the 400 civil society groups that has come to Marrakech to be involved in the conference and its discussion on migration. One element of this radio station’s operation, which sets it apart from the other 700 registered media at the conference, is the involvement of a number of migrants in the editorial team to ensure the migrants’ concerns both directly influence the station’s programs and are addressed by broadcast content. The station has also opened its shows to several different nationalities to talk about the particularities of migration across different countries. But the station’s policy of inclusive employment for migrants doesn’t mean those individuals are reassured by the Compact they are reporting on. When it comes to ownership of its own message, the station has striven to maintain its independence. “Independence is a fundamental principle for the success of the radio station achieving its objective of delivering good quality news about its subject matter,” Ghattass says. This means, he says, the station has avoided political or religious angles influencing its migration coverage, an aspect that many are increasingly concerned about when it comes to how immigration stories are often shaped in the global press. Those involved with the station hope it ultimately underlines the importance and role of community media in defending human rights. The station became the voice of civil society that is concerned by immigration issues,” says Jalal al-Makhfy, a volunteer radio journalist from another Moroccan station who has been producing a daily talk show that features guests from numerous walks of life related to immigration.